International Education Week (IEW) is an opportunity to celebrate the benefits of international education and exchange worldwide. This joint initiative of the U.S. Department of Education (ED) and the U.S. Department of State is part of our efforts to promote programs that prepare Americans for a global environment and attract future leaders from abroad to study, learn and exchange experiences. • Use hashtag #IEW2018 and follow on Twitter at @GoGlobalED! • Download IEW 2018 Social Content and Filters from the U.S. Department of State. 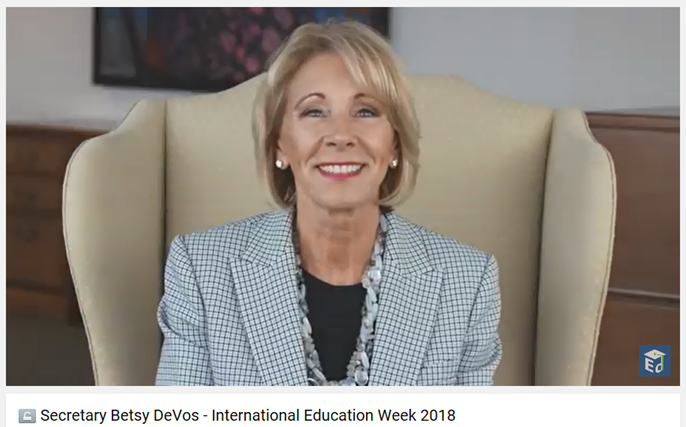 The U.S. Department of Education hosted this special event in the lead-up to International Education Week. The panel discussion included insights from Assistant Secretary Scott Stump, Office of Career, Technical and Adult Education. The event also included perspectives from a senior official from USAID and a representative from the Embassy of Switzerland. 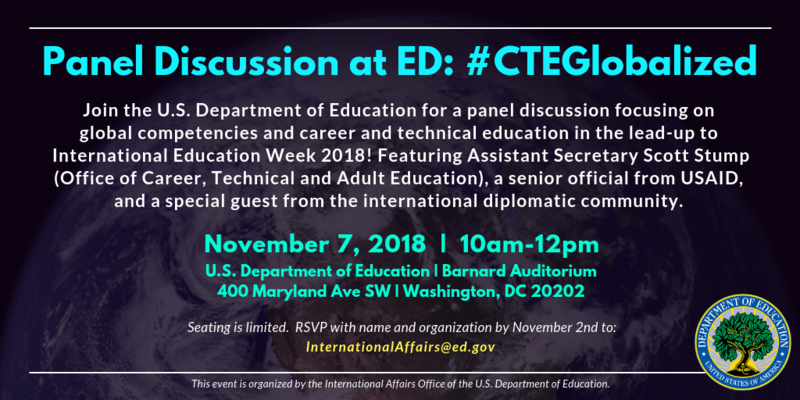 To celebrate International Education Week 2018, the U.S. Department of Education invites you to a “Global Competencies for Career Success” workshop aimed at helping educators incorporate global competencies into their career, technical, and STEM education programs. This “mini summit” powered by Teach to Lead will use teacher leadership as a key strategy in the development and implementation of logic models/action plans to empower teachers to lead change in their communities without having to leave the classroom. 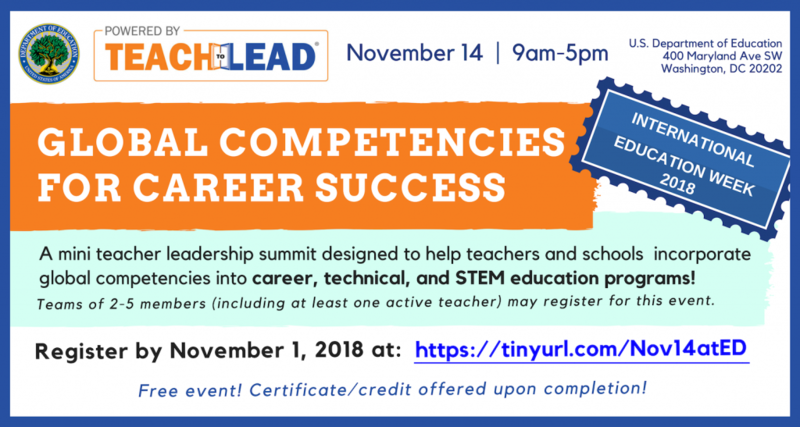 Teachers, school administrators, and other stakeholders interested in adding or further developing global competencies into CTE and/or STEM programs are invited to participate in this one-day workshop. Teams comprised of 2-5 members must include, and be led by, at least one current teacher. During the workshop, teams will network with and get feedback from other teacher leaders and experts, partner with critical friends from the field of international education, have focused time for collaboration, and participate in targeted skills development sessions designed to increase project success. Certificate/credit will be offered upon completion.